The point of this film is to simply pay homage to the team, and that’s okay. It is, after all, produced by the NBA, and it's doubtful a league so controlling of its own image would portray anything in a negative light when celebrating one of its greatest moments. This is a work that’s been made to pay homage, and that’s exactly what it does. Following the team through its formation and early days, it spends surprisingly little time focusing on the Olympic games themselves. But with players this legendary—and with characters and ego this expansive—there’s plenty of opportunity to get some great bits, like the fact that the game’s biggest star, Michael Jordan, was hesitant to come on board, joining the team only after the likes of Larry Bird, Magic Johnson, and Patrick Ewing had been brought on. The film also hits on Jordan’s almost maniacal competitive edge, though it shies away from hinting that this, and not Jordan’s patriotic pride, were what inspired him to join the team. What it does reveal, though, is just as fun and interesting. The team was formed during the height of success for the “Bad Boy” Detroit Pistons, led by point guard Isiah Thomas. The Pistons had grown notorious for their dirty play and also happened to be the heated rivals of Jordan’s Bulls. While their coach, Chuck Daly, had been selected to lead the Dream Team, Thomas’ absence has always been conspicuous and legend has always been that he was kept off the team because Jordan and Scottie Pippen didn’t want him there. In one of the more entertaining moments of the documentary, Pippen and Jordan both own up to the story while the film also throws in an outtake from a promotional interview for the team where Jordan demands, “No Isiah questions.” But later, the film also touches on the way Daly shrewdly bonded with Jordan, despite their previously icy relationship, on the golf courses of Monte Carlo. Both moments are fantastic in the way they show how delicately the egos of the best basketball players in the world had to be handled and balanced just right to make the team the success it was. There’s also footage of several famous scrimmages that have since passed into legend but, until this film, hadn’t been widely seen. The first is the scrimmage in which the Dream Team actually lost to a team of college all-stars, a shocking moment that was kept away from the prying eyes of hundreds of members of the press. The kicker comes when Duke coach Mike Krzyzewski, serving as an assistant coach, reveals that Daly actually threw the game without anyone else’s knowledge, knowing the loss would serve as a wake-up call to the stars and their egos. Almost as fun is video of the next scrimmage the following day in which the Dream Team, now hell-bent on revenge, obliterates the same team of college all-stars. And, perhaps the most fun of all, is footage of the famous scrimmage in which the Dream Team split into two teams of five, save the poor college kid Christian Laettner, and played an all-out, balls-to-the-wall game of five-on-five, essentially a one-on-one alpha male duel between Magic Johnson and Jordan in which Magic finally accepted the torch had been passed. The film has success in conjuring conflict in these scrimmages and in the way the egos on the team had to learn to mesh. (Not for nothing, the more modest players like Clyde Drexler and John Stockton also have the least amount of interview time.) But, elsewhere in the film, similar attempts to raise conflict fall flat, the film's main weakness. That the Dream Team would cruise to a gold medal was never in doubt, but the film tries its best to raise that issue early on, to no avail. And, later, the film also tries to make a fun villain out of Charles Barkley and some of his more brash behavior (namely his physical play and elbow-throwing against Angola). The problem’s that for fans of the NBA—and this film is produced by the NBA so it should know better—Barkley’s physical, aggressive play was part of what fans loved (or hated) about him; it’s creating controversy out of nothing. Still, these are minor quibbles, as there’s plenty to enjoy, like the aforementioned scrimmages and the players goofing around. One of the most delightful moments is footage of John Stockton wandering the streets of Barcelona with his family during the Olympics. The family runs into a woman decked out in an American flag and a Dream Team t-shirt, yet she doesn’t recognize Stockton at all, something Stockton clearly delights in until his young sons reveal his identity. It’s also fun to see Pippen and Jordan viciously picking on Tony Kukoc, a player that would wind up playing an integral part of the Bulls’ second title three-peat in the mid-90s. I mentioned earlier the way the Dream Team’s stature has increased partly due to the comparison to the subsequent Team USA squads. The 1996 and 2000 teams retained the gold, but the program had a tougher time recruiting star players as the novelty wore off and hit a nadir in 2004 when the United States had to settle for a bronze, a result of improving competition and lackadaisical play. The 2008 squad, labeled “The Redeem Team,” managed to finally pull back in superstars like Lebron James, Kobe Bryant, and Chris Paul. Even as that team won a hard-earned gold, it still fell short of the ’92 team. None of this, of course, is addressed in the film. 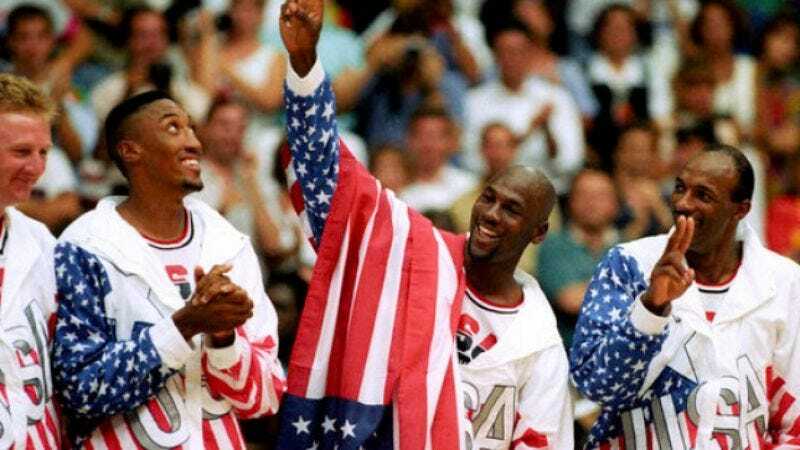 No team ever will match the once-in-a-lifetime collection of hall of famers that the Dream Team was. No team will ever have players that had the competitive fire of Jordan, Bird, and Magic and the film smartly stays focused on that. It’s hard not to seem overly nostalgic in looking back at the team, yet the film largely avoids that pitfall, instead just making an assumption that the team was the greatest ever. And after viewing the film, there’s little argument in that. If you need even more great Dream Team stuff, be sure to check out GQ’s excellent oral history. While it’s not surprising NBA TV chose to air the doc on an off night during the NBA Finals, it’s also sort of fitting given that the Miami Heat are in the Finals. Conspiracy theorists have claimed that while playing in Beijing in 2008, several USA Olympic players—including Dwyane Wade, Lebron James, and Chris Bosh—colluded while on the team to all sign with the same team when their contracts were all up in the summer of 2010. You know it’s an NBA-produced documentary because it has footage of Michael Jordan, a well-known gambler of staggering proportions, in Monte Carlo, a well-known gambling city of staggering proportions, and the only off-the-court footage is of him on the golf course. Was it this trip that eventually led to [conspiracy theory alert!] his secret two-year suspension by Commissioner Stern to deal with his gambling debts and issues? I was 13 during the 1992 Olympics, so I remembered most of the games but I did forget that the team came at the end of Bird and Johnson’s careers and their inclusion was more of a hat-tip than anything. The sight of Bird on the sideline stretching his bad back during the five-on-five scrimmage was kind of sad in retrospect. If you want to relive entire games from this era, they’re out there on YouTube. Watching the team is like watching the Harlem Globetrotters decimate a junior high team; it’s staggering. Bring back that old USA logo. It’s amazing.